Pseudomonas spp are very widespread in nature particularly in water. There are a large number of different species in this genus. Certain species such as Pseudomonas aeruginosa are opportunistic pathogens generally infecting immunocompromised patients such as those suffering from cystic fibrosis or AIDS where they attack the respiratory tract. 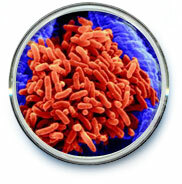 Increasing antibiotic resistance is being noted in the genus giving cause for concern. A significant number of species can produce exopolysaccharides that form slime layers and can lead to biofilms. These biofilms in water systems can harbour more serious pathogens such as Legionella spp so should not be allowed to build up. The genus is also a food spoilage agent and typically produces a fruity odour in spoiled food as well as a slimy texture. Some members of the genus are being used in bioremediation and are known to degrade compounds including polyaromatic hydrocarbons, toluene and carbon tetrachloride. Technical Data: The Pseudomonas spp are rod-shaped, aerobic (occasionally facultatively anaerobic) gram negative bacteria. They are catalase positive, oxidase positive and most species also secrete fluorescein, a yellow green pigment.